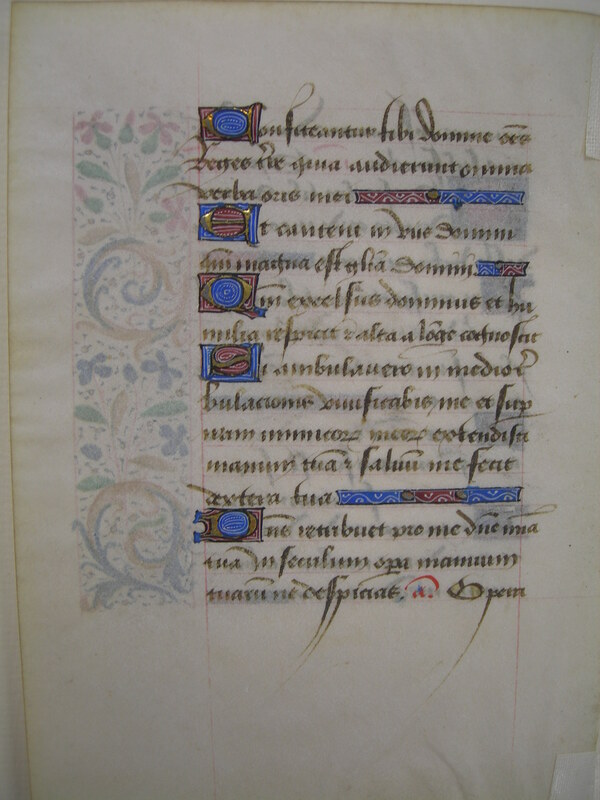 Text: This leaf contains text from the Office for the Dead at Vespers (including Psalms 137). Reconstruction Note! 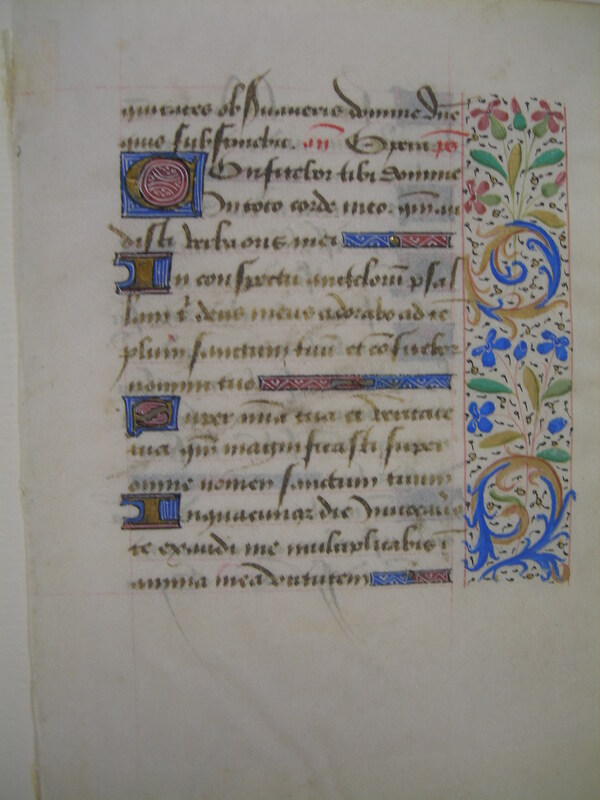 In Ege's original manuscript, this leaf probably followed what is now Leaf 50 in the University of Saskatchewan portfolio (we need to see other side of Saskatoon leaf to be sure), and did precede what is now Leaf 50 in the Cleveland Public Library portfolio. -quitates observaveris Domine, Domine quis sustinebit? Ant: Opera. Psalmus. Confitebor tibi Domine in toto corde meo: quoniam audisti verba oris mei. In conspectu angelorum psallam tibi: adorabo ad templum sanctum tuum, et confitebor nomini tuo. Super misericordia tua, et veritate tua: quoniam magnificasti super omne nomen sanctum tuum. In quacumque die invocavero te, exaudi me: multiplicabis in anima mea virtutem. ..Lord observe iniquities, O Lord who shall be able to endure it? Ant: The works. Psalm. [Psalms 137] I will confess to thee O Lord in my whole heart: because thou hast heard the words of my mouth. In the sight of Angels I will sing to thee: I will adore toward thy holy temple, and will confess to thy name. Upon thy mercy and thy truth: because thou hast magnified thy holy name above all things. In what day soever I shall call on thee, hear me: thou shalt multiply strength in my soul. Confiteantur tibi Domine omnes reges terrae: quia audierunt omnia verba oris tui. Et cantent in viis Domini: quoniam magna est gloria Domini. Quoniam excelsus Dominus, et humilia respicit: et alta a longe cognoscit. Si ambulavero in medio tribulationis, vivificabis me: et super iram inimicorum meorum extendisti manum tuam, et salvum me fecit dextera tua. Dominus retribuet pro me, Domine misericordia tua in saeculum: opera manuum tuarum ne despicias. Ant. Opera. [continues Psalms 137] Let all the Kings of the earth O Lord confess to thee: because they have heard all the words of thy mouth. And let them sing in the ways of our Lord: because great is the glory of our Lord. Because our Lord is high, and he beholdeth low things: and high things he knoweth far off. If I shall walk in the midst of tribulation, thou wilt quicken me: and upon the wrath of mine enemies thou hast extended thy hand, and thy right hand hath saved me. Our Lord will repay for me, O Lord thy mercy is forever: despise not the works of thy hands. Ant: The works.